Today was a lazy rest day. I should have gone for a walk but instead we pottered around inside Waiouru. Jan has been delving into my father’s ancestors discovering that on his mother’s side they had money. I wonder what happened to it? It appears the Everard’s and the Breach’s had very large families. Usually 12 to 16 children so it probably got divided to non existence. What a pity they didn’t have TV’s back then. Dad didn’t know much about his mother’s relatives. Apparently she was 5’6” and frightened of nothing. Quite a ‘tomboy’ who, after being expelled from a number of schools for young ladies for fighting, was invited by the ‘family’ to leave England. She duly headed off to the colonies meeting and marrying my grandfather on the way. They purchased a small block of land north of Auckland and commenced dairy farming using her small inheritance to pay the deposit on the land. Regrettably, within only a couple of years the Great Depression wiped them out and they lost the farm forcing them onto the road. Within a generation my relatives went from reasonably wealthy to dirt poor. Such is life! 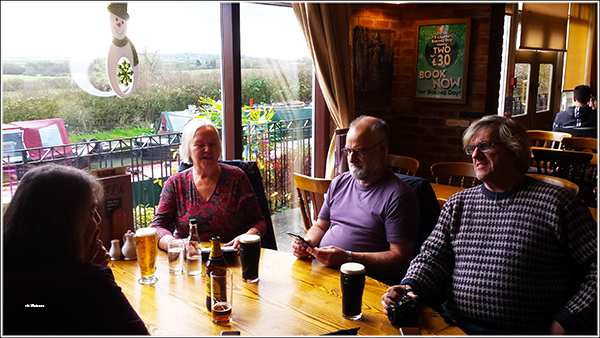 Yesterday Maffi invited us to join him and the crew of Oakfield for Sunday lunch at The Boathouse. We usually try to have a Sunday roast meal and as we’d not previously met Keith & Anne (Oakfield) we most willingly accepted the invitation. We’d only just completed the introductions and seated ourselves at the table when Maffi produced his camera. Oops….. batteries required. Then the flash needed to be activated. Meanwhile Keith produced his phone and took an photo of the photographer. That done, I produced our mobile phone and took yet another photo of the group. We had a very pleasant meal together although over indulging in dessert (I was led astray by Maffi) resulted in me having to subsequently examine the inside of my eyelids for an hour in the afternoon). If you look closely at the above photo you can see the bows of Waiouru and Milly M in the background. Oh, we must be a strange group of boaters as the subject of toilets never arose! Small maintenance task. Jan mentioned the light/extractor fan in the shower was making a strange noise. I immediately removed it from the ceiling for examination. The fan housing and blades were covered in accumulated sticky dust and human hair. Fortunately Jan’s toothbrush was handy (you didn’t think I would use mine!) which enabled me to remove all this crud from the fan to the bristles before re-installing the fan. I think this is going to need to be an annual maintenance task.